Well, you know about kali Linux right! 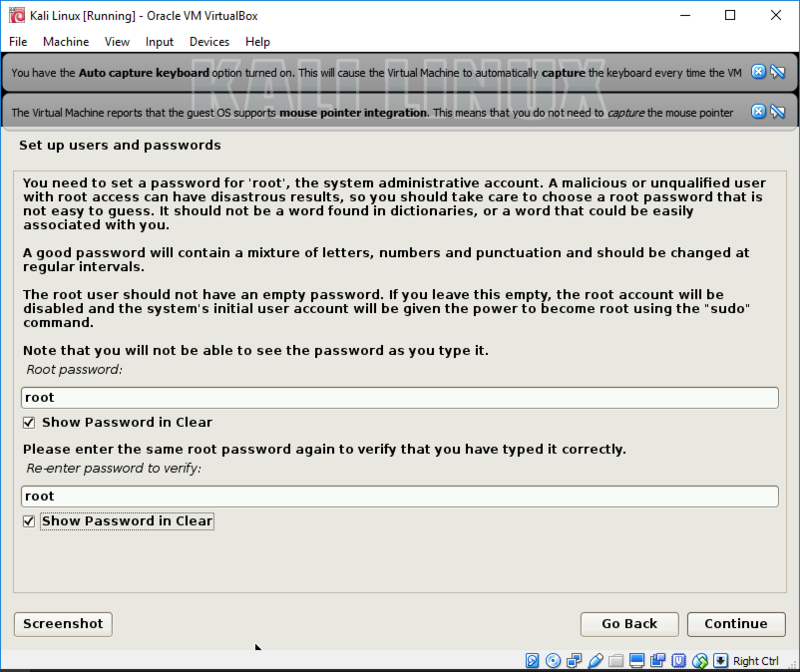 It is the most beloved operating system of pentesters and hackers. With tons of hacking tools backed by a large community of active online users, Kali Linux is the best choice to start learning pen testing and become a bug hunter. You can use kali Linux with different methods like by making a live USB, install it on your PC, dual booting it with other OS like Windows 10, or you can easily install and use it on a virtual machine. 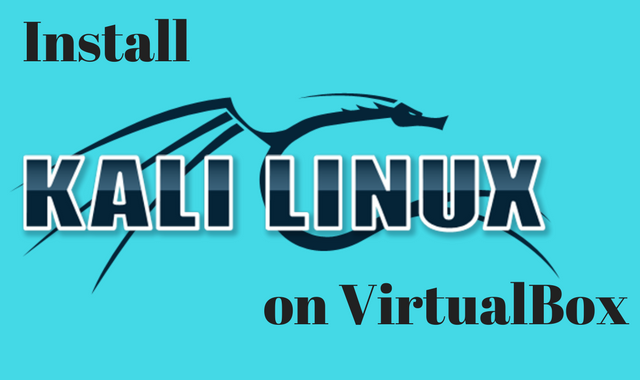 In this article, you will learn how to install Kali Linux on Virtualbox. 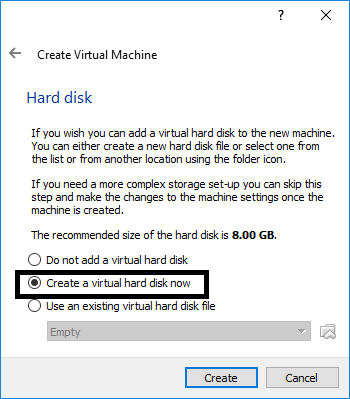 There are many options available to choose for virtual machine some of them are free and for some, you have to pay. I will use virtual box to use with Kali Linux because it is a free and open source, and comes with a very easy to use interface. 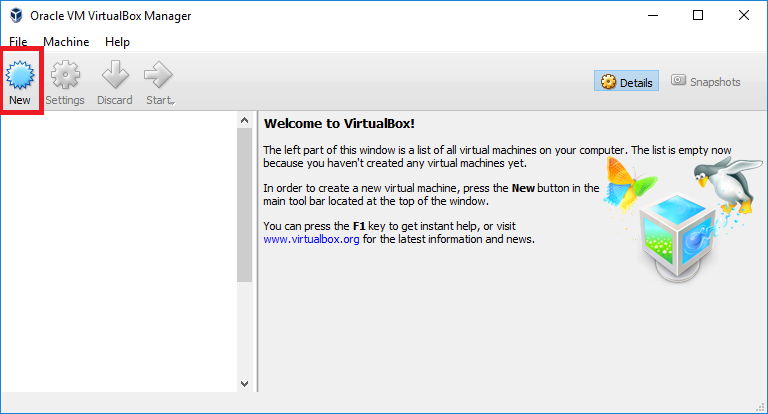 You can use virtual box to install other operating systems too like Android, Windows, MAC, and another version of Linux. The virtual USB 2.0 (EHCI) device. 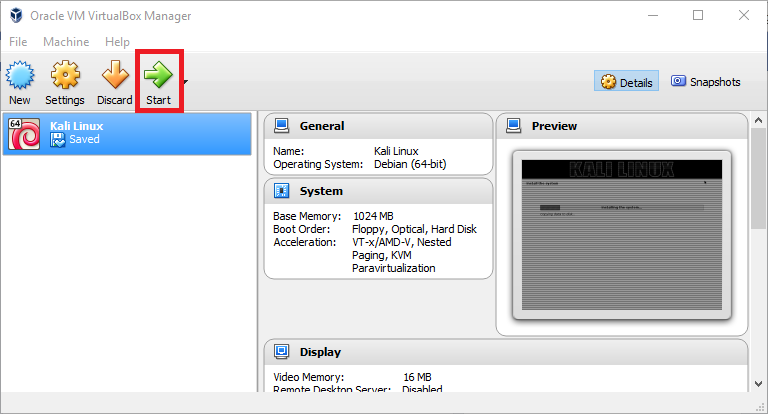 VirtualBox Remote Desktop Protocol (VRDP) support. 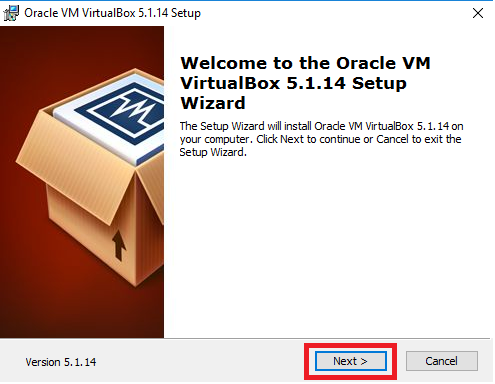 Step 1: Install virtual box on your PC. 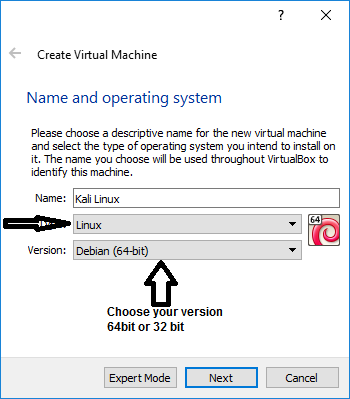 The installation process of VirtualBox is simple just open the setup you downloaded earlier and click next leave everything as default till finish. 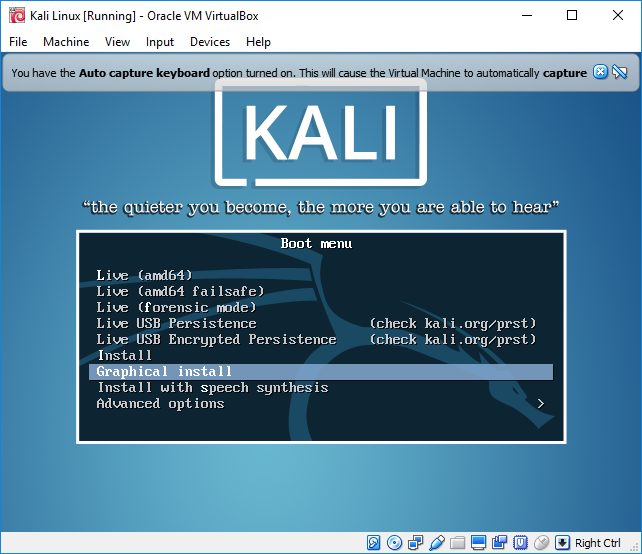 Step 2: Create the virtual machine to install Kali Linux. Name your OS i.e Kali Linux and choose type as Linux, select the version 64bit or 32bit must same as the kali Linux ISO you have downloaded click Next. 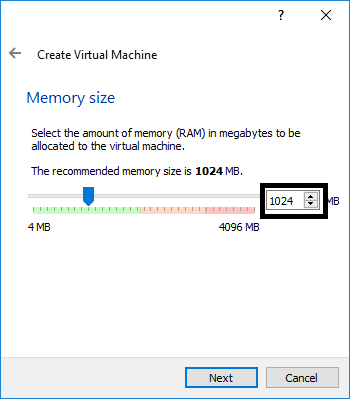 Choose your Memory size i.e Ram size must be equal or greater than 1024 MB which is equal to 1 GB. 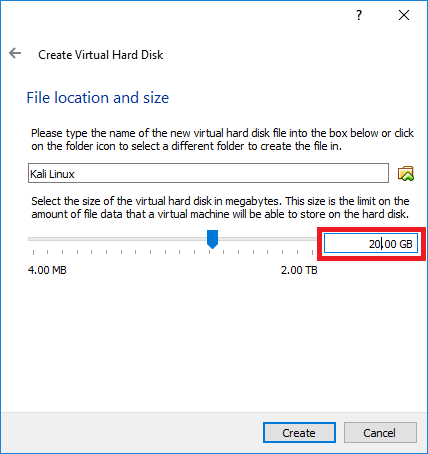 Create a hard disk for your virtual machine. Set your Hard disk size 20 GB or greater, and click on create. Your Virtual machine is ready to install Kali Linux. 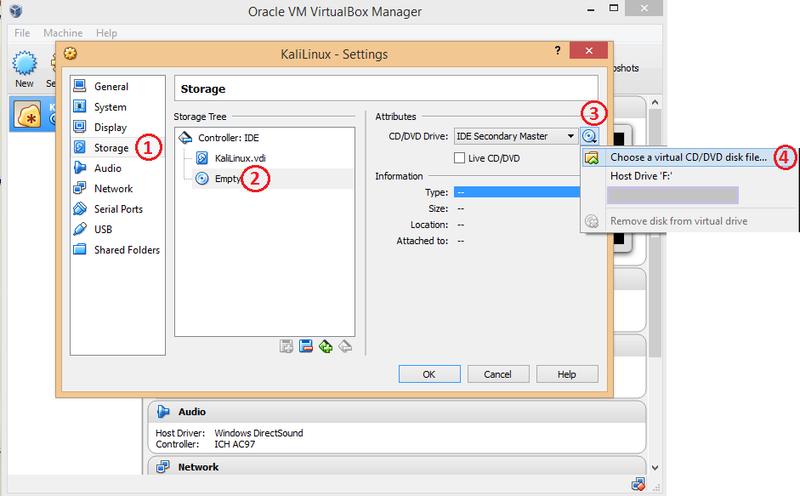 (1)Choose storage (2)choose Empty (3)Click on DVD icon next to IDE Secondary Master (4) Choose a Virtual CD/DVD disk file, Which is the Kali Linux ISO you have downloaded. Click Ok. 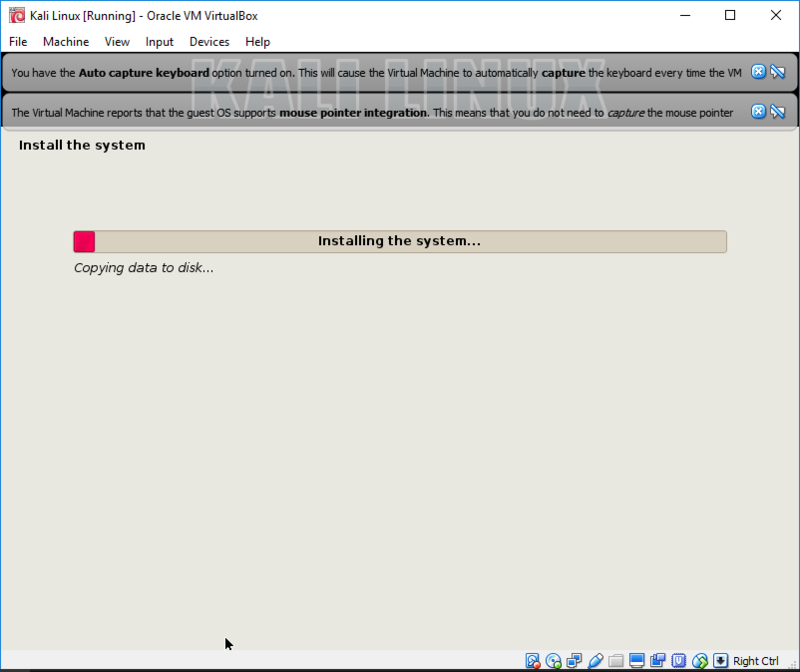 Choose Graphical Install, because it is easy to use. Choose your Language and click contineue. I have to skip some parts because they are very simple just leave them default and click continue until you reach here to choose your password. I have to skip some parts just leave them default choose continue until you reach here. Choose Guided- use entire Disk and click contineu. 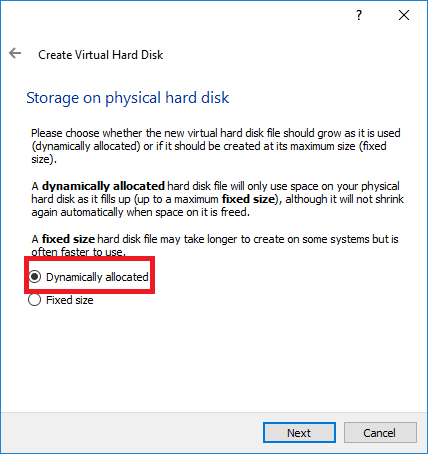 One step has been skipped just choose default and click continue until you reach to select partition Scheme. Choose All files in one Partition because it is recommended for the beginners. Choose Finish and click Continue. Choose Yes and click continue to start the installation process. Wait till the installation gets done. After the installation gets done you have to Remove the Kali Linux ISO image. 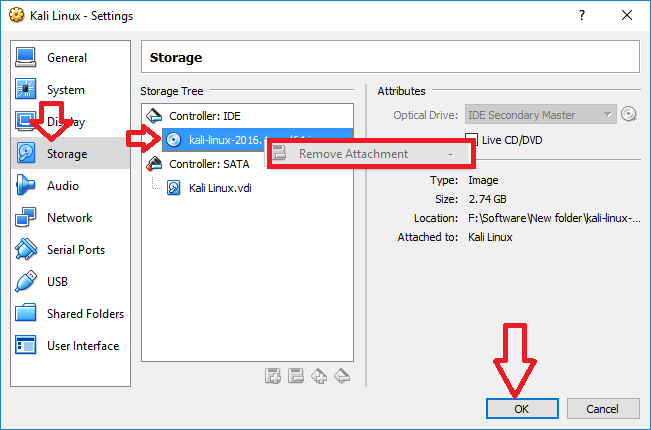 Go to settings and choose storage under the Controller: IDE click on Kali-linux-2016 and choose Remove Attachment. This step is very important otherwise, the installation will restart. I installed kali linux kali-linux-2017.3-amd64.iso in VirtualBox on my Windows 7 (64). 2. When I start my pc, Windows start with Startuprepair and after Windows It start up again, the VMBox(oracle) is completely deleted. I’m a newby, can you please tell me what I do wrong? Why i have to remove Kali Linux ISO after installation ? About Removing the Kali Linux ISO Image, It’s not there It’s said ‘Empty”so there’s nothing to move. If your Kali Linux is running without any problem then you don’t need to do anything else. After the Install from Virtualbox+ Linux Kali on my Windows 7 64, It’s all up and running untill I reboot my PC. 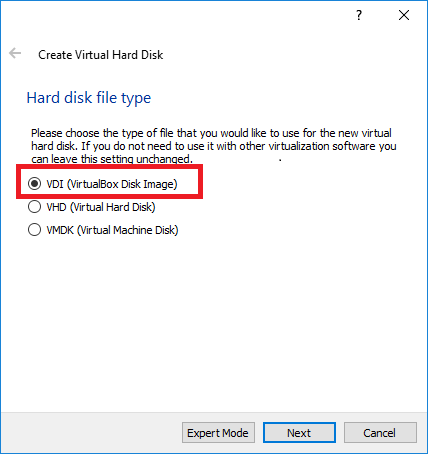 Windows wont let Virtualbox start, Windows boot in ‘Startup Repair”after the boot, the Virtualbox Is deactivated bij Windows. 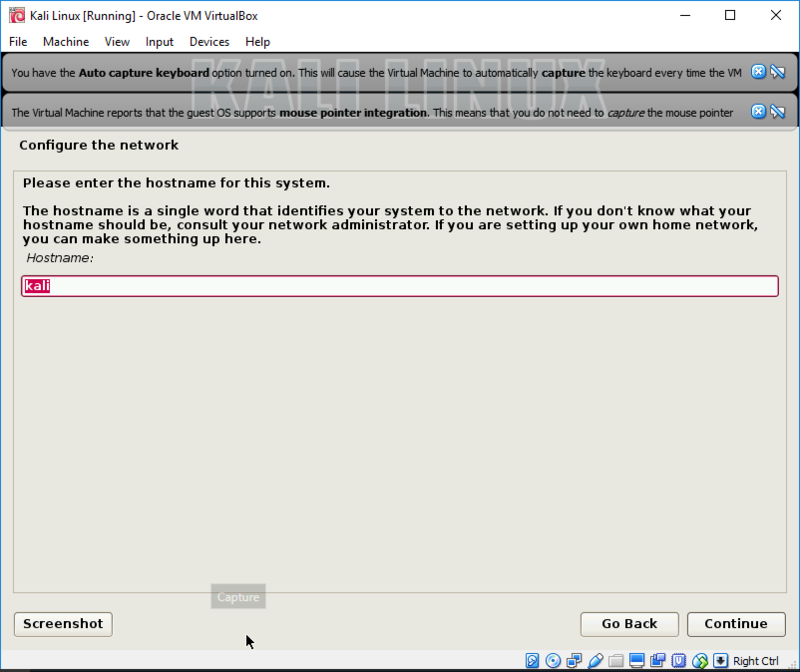 I deinstalled and reinstalled Virtualbox+ Linux Kali twice but Windows keep Deactivating the software. Can i run Kali Linux on it for Pen Testing? I have installed the Vmware machine player but when i reboot my pc, Windows still does a startup Repair. I gues it got to do with the drivers or Bios settings. i’m studying Ethical hacking but i’m stuck now because of this 🙁 I hope if someone please can help me with this? Please specify your problem I will Guide you in installing Kali Linux. 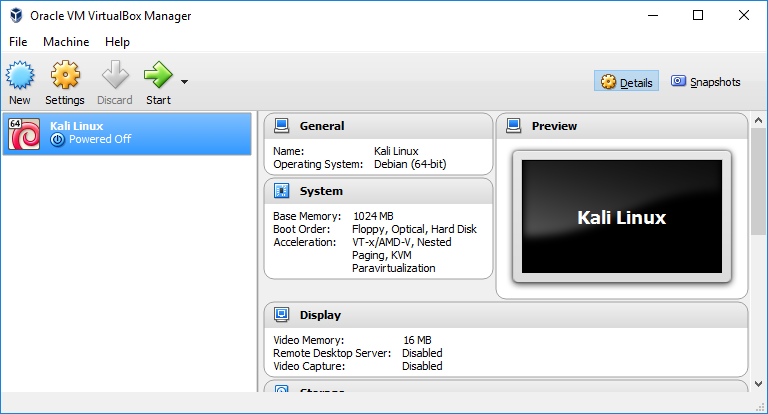 I have a blank screen and on the VM box it says that Kali is running. It is a black terminal with a blinking cursor. How do I get into the startup screen or interface? I am confused. Thanks.